A builder who fleeced an elderly Poulton couple out of thousands of pounds over roofing work has been jailed.' Steven Robinson and another man cold called at the home. Their victims, both in their eighties, were led to believe that a large amount of work needed doing.' A total of �5,050 was handed over, but a check later revealed all that had been done was some power washing and installation of dry verges which were not the right ones. 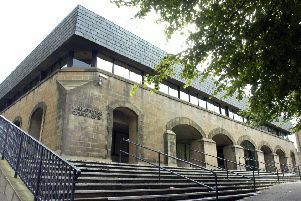 A devastated elderly couple who were fleeced out of thousands of pounds by a callous fraudster roofer have criticised the length of his jail sentence. Former Lancaster resident Steven Robinson, now of Edge End Road, Buttershaw, Bradford, called at the elderly couple’s home in Poulton with another man saying work needed doing to their roof. But after more than £5,000 was handed over by the couple, a check found all the 31-year-old and others had done was some power washing and installation of incorrect dry verges. Robinson was eventually questioned by police, but in the meantime carried out another fraud on an 84-year-old woman who was persuaded to pay £23,000 for a new roof, with just a small amount of work done. Robinson pleaded guilty to two offences of fraud over the incident in October 2012. He was sentenced to 18 months in prison at Preston Crown Court – a sentence his victims said is simply not long enough. The 82-year-old owner of the home, who asked not to be named, said: “These days they seem to give small sentences. It is not just him, it is anyone who does something wrong. “It is not enough – we will not get our money back. His son added: “He has been jailed but it is not enough. It has not helped us – the couple have lost more than £5,000. Rachel Woods, prosecuting, said the owner of the home where the work took place described Robinson as being the sidekick to someone who appeared to be the boss. The pair cold called at the couples’ address, claiming there were loose slates on the roof. The first man offered to take a closer look for £150. Robinson joined him and they went to look at the roof. A £4,000 price was given. The police were informed due to concerns of the couple’s son and a neighbour. When arrested Robinson told the police he had done work at the Poulton address for some travellers, but could only name the man it was subcontracted out to as Andrew, someone he had met in a Lancaster pub. Brian Williams, defending, said Robinson had not been the main mover in what took place and wants to be a family man.